Wonder Woman. Credit: Warner Bros.
What is it about? Wonder Woman is the fourth movie in the DC Cinematic Universe and is set during World War I. It follows Diana (Gal Gadot), who is a princess on Themyscira, an island in the ocean occupied by only women. One day, a plane crashes in the ocean and Diana discovers a soldier named Steve Trevor (Chris Pine): the first man she has ever seen. From him, she learns about the ongoing war and feels the need to stop it, so she goes with him to fight in the war. Steve Trevor (Chris Pine) and Diana Prince/Wonder Woman (Gal Gadot). Credit: Warner Bros.
How is it? 8.8/10 Tasked with delivering one of the first female-led, female-directed big-budget superhero movies…ever, as well as rescuing the DCEU from a critical slump, Wonder Woman is fantastic all around. However, it does face some problems. 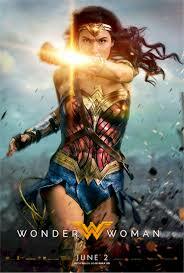 The Ups There is a lot to love about this movie, and the biggest thing, perhaps, is Gal Gadot as Wonder Woman. She gives the audience an excellent, well-rounded performance that conveys all of Diana’s strengths and flaws and defines her as THE Wonder Woman. Her character tells a fish-out-of-water story, as she isn’t used to either men or modern society, which brings plenty of laughs. Gal Gadot as Wonder Woman. Credit: Warner Bros.
Chris Pine almost rivals Gal Gadot in terms of an amazing performance. He brings the charisma and charm in spades and is very believable as Steve Trevor. His comedic timing both reacting to Diana’s distinct culture and trying to help her blend in is really, really funny. The two stars’ chemistry is off-the-walls. You cannot take your eyes off the screen when the two are together and they bring a heartfelt, at times, comedic, relationship to the movie. This movie has lots of comedy and definitely is funnier than previous DC films, with the entire cast having their share of laughs. Speaking of which, the supporting cast is great. A standout for me was Lucy Davis as Etta Candy, Steve Trevor’s assistant. Patty Jenkins provides fantastic direction in the film and carries it well. She brings many tender, quiet moments that are, honestly, as great as the action. There is genuine emotion in this movie: there are many compelling character-driven moments that are very affecting and involving. 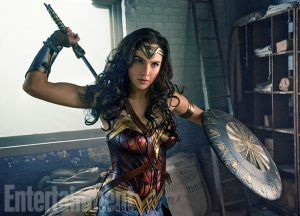 Wonder Woman during the thrilling sequence where she steps into No Man’s Land and faces an army of soldiers. Credit: Warner Bros. The action in this movie is just…wow. It has many brilliantly choreographed and epic action set-pieces including a grand battle at Themyscira, another one where Wonder Woman takes on an army of German soldiers (my favorite scene), and the final CGI fight. Slow-mo is utilized to awesome effect here in every battle. This movie deserves praise for its lighthearted tone and hopefulness. 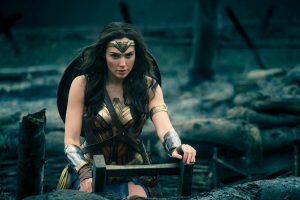 The Wonder Woman we see in this movie has no sense of cynicism and is innocent and hopeful, which is refreshing , as most superheroes today spend their time brooding. Additionally, this movie utilizes COLOR, unlike a lot of recent superhero movies: this is a superhero movie, after all. 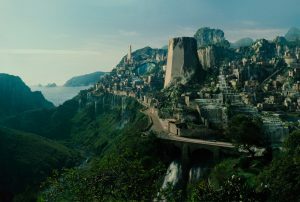 The lush island of Themiscyra, a key location where color really shines in this film. 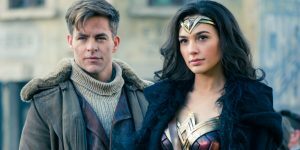 Credit: Warner Bros.
A great thing about Wonder Woman is that it is very standalone in the DCEU: sure, there are some connections to the greater universe, but in functions great on its own. Finally, the visual effects in this are fantastic, as would be expected from a superhero movie today. The Downs Now, the problems with the movie. My main issue with Wonder Woman is its villains. 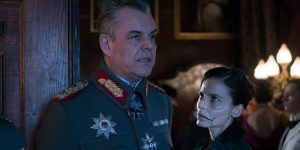 There are three main villains, General Ludendorff (Danny Huston), a German general; Doctor Poison (Elena Anaya), a chemist cooking up deadly gases from Luderndorff to unleash; and Ares, the CGI big-bad of the film, who I won’t give too much away about. None of these three villains have much development, motivation, or payoff at all, so you really don’t care a ton about them. General Ludendorff (left) and Doctor Poison (right). Credit: Warner Bros. The third act in Wonder Woman, sadly, resorts to your typical superhero blockbuster fare in that its doused in CGI with giant explosions, This isn’t necessarily a bad thing, it just feels very familiar and is dragged out a bit. The effects in this movie, at times, is slightly questionable and I don’t love the visuals on her Lasso of Truth. Some of Wonder Woman’s giant jumps in action sequences look a little cartoonish also. In addition, the slow-mo does feel a little overused sometimes, but is mostly great. Overall, Wonder Woman is a wonderful (no pun intended) movie that has two extremely likeable stars, great comedic chemistry between them, a perfect Wonder Woman in Gal Gadot, thrilling action, a hopeful lens for the DCEU, and a genuinely emotional touch. However, it does face some problems with its underdeveloped villains and standard third act. I agree with a lot of this, but the ending is really terrible. It cannot be stressed enough that this scene is what ruined the movie for me. If you want to see my opinion of this, I’ll have a review up on my channel soon. I always appreciate a well-thought post. I hope to watch the movie soon. Thanks for the informative post!